Everywhere you look, there are fresh new trends in cabinetry colors popping up. There's something for everyone and every style; we can't get enough of the plentiful, beautiful options! In particular, we adore the many tones of gray, natural wood, white and black that are offered in the Keller Homes Design Studio. Here are some of our favorites in action. You've heard it before: gray is the new neutral. It sets a beautiful backdrop for woods, whites and pops of color. Whether a transitional style (left) or more modern (right), what started as a "trend" is surely here to stay. Natural wood tones - especially in modern styles - are back in a big way. We love the richness that our stained maple cabinets bring to a kitchen, especially when paired with white! Lighter woods are also popular again, and look beautiful paired with colorful accents. It's hard to beat a bright, white kitchen. White provides a beautiful backdrop for any style, especially a classic aesthetic. We love it paired with a variety of ceramic tile backsplashes, wood floors, and quartz countertops. It's a winning combination! If you're hoping for a stunning option, look no further. Black cabinets are a strong statement, it's true, but they're also timeless. Black goes with everything! We love it paired with stainless accents and pops of white. 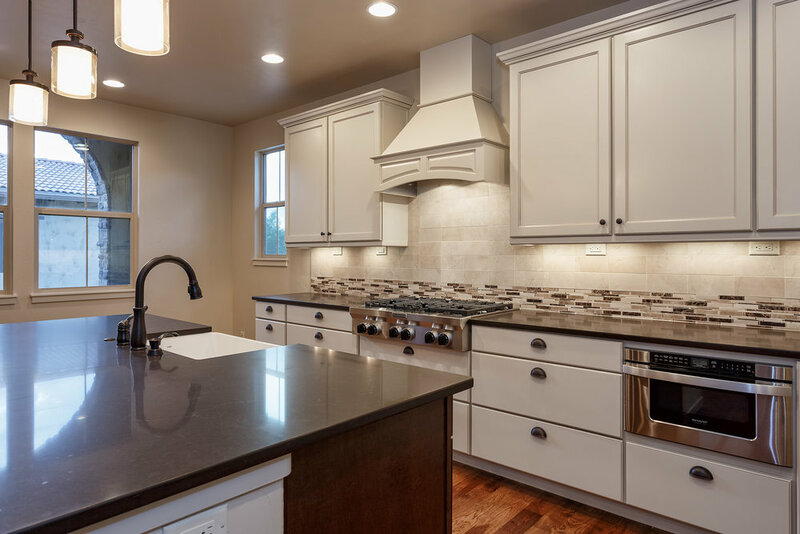 We're delighted to offer a variety of beautiful options in the Keller Homes Design Studio; whether you're hoping for a classic look or a modern take, we have the right cabinets for you! Hope to see you in for a preview soon. Newer PostParade of Homes Winner!